Hyderabad, July 30th 2011: While many states like Bihar, Orissa, Madhya Pradesh, Karnataka, Kerala and Chhattisgarh have stopped all field trials of Genetically Modified (GM) crops in their states, it is alarming that several GM crops are being allowed for field trials and seed production in Andhra Pradesh. The nationwide Coalition for GM-Free India, following their national meet in Hyderabad, urged the government of Andhra Pradesh to disallow all GM crop trials in the state. Cautioning against any move to revoke the requirement of state government’s NOC for any GM crop field trials, the Coalition for a GM-Free India reminded the GEAC that Agriculture is a state subject as per the Constitution and that the Indian regulatory system should uphold this authority. The Genetic Engineering Appraisal Committee in the MoEF had recently formalized the processes for its field trial authorisation procedures, that now requires GM crop developers to obtain an NOC from state governments before permission is given by the GEAC. However, the industry is pressurizing the GEAC to revoke this clause. “There is absolutely no basis on which the industry bodies like ABLE should be resisting this new norm in the Indian GM regulatory regime. Agriculture is a State subject as per the Constitution of India. What’s more, many state governments have been asking actively right from 1998 for a say in GM crop related decision-making in the country. The former Environment Minister has been right in conceding this. In fact, as per the Cartagena Protocol on Biosafety, public consultations should be a part of decision-making and India is a signatory to this international agreement. Moreover, Panchayats should have their right, constitutional say in the matter too. 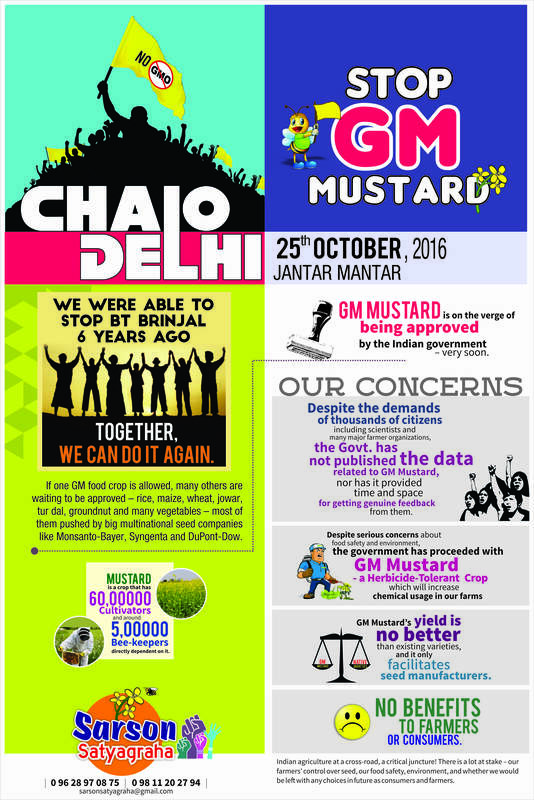 We warn GEAC against any denial or violation of any any democratic, constitutional mechanisms related to GM decision-making in India”, said Kavitha Kuruganti from the nationwide Coalition for a GM-Free India. Leaders of the campaign who addressed the media included Pankaj Bhushan of GM-Free Bihar, Saroj Mohanty of Paschim Orissa Krushak Sanghatan, Krishna Prasad of GM-Free Karnataka, Dr.Ramanjaneyulu from Centre for Sustainable Agriculture (CSA) and K.Sajaya from Caring Citizens Collective which works on the issue of farmers’ suicides in Andhra Pradesh. Monsanto was recently caught violating numerous biosafety norms in such a field trial in Karnataka and the government is investigating the case right now. Meanwhile, AP has several field trials and seed production trials approved by GEAC, in Medak, Rangareddy, Warangal, Mahbubnagar, Kurnool districts. Civil society groups point out that the GM maize which is being tried in AP is known to cause numerous health and environmental risks, apart from causing potential adverse socio-economic impacts.